With a bit of over night rain and no sign of the sun today Monty and I headed out on the bikes again. Today we headed to Strathpeffer just north of Inverness. The woods just to the north of Strathpeffer are home to the Strathpuffer 24 hour mountain bike race (﻿http://www.spanglefish.com/strathpuffer/index.asp) the next one is in January 2011. Before you ask no we are not training for it! However we did do a loop of the course that is cycled for the race and it is great. Really technical but not too hard and nice and natural. We then headed over to the other side of A834 and up onto Cnoc Mor which was a little damp but good fun. After all that hard work we thought we had deserved one of the famous Maya Hot Chocolates in Strathpeffer before heading home. I am off down to Perth tomorrow for a Mountaineering Council of Scotland Safety Advisory Group Meeting, but it looks like it is going to be a good day to be indoors! With a dry forecast Monty and I headed to Latheronwheel today on the Caithness Coast. This was my second visit to this area this summer, back in July we could not get on many of the routes in the Peninsula Wall area due to nesting gulls so that was the target for today. A good job too as with the high tides many of the areas were wet at the base. The peninsula area is only just affected by the tides and there is a good range of routes between Severe and HVS, the rock is generally good with sound gear when you need it. Although sunny it was still chilly and I don't think there will be much more rock climbing this season. Laura had a rare day off today so we decided after some DIY to head to Fochabers for a quick blast around the mountain biking trails there. We did the Haggis which must be one of may favourite blue trails, after a not too bad pull up to the top of the hill it is just fast, flowing fun all the way back to the car. Lots of jumps, berms, table tops etc but all can be done at a gentle pace if you don't want to push it, and at 15km it is a reasonable distance as well. The trail does not suffer too much from the wet either, it drains well and does not get too boggy like the trails the other side of the A96. All in all a great day out. Forecast looks good for the next few days so hopefully I will get a few final days rock climbing in before it gets too cold! Monty and I headed out for a bike this morning after the heavy rains of the past 24 hours had ended (although there are still some fairly big pools around!). 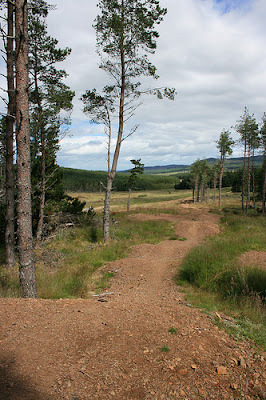 We decided to head for the trails just to the west of Inverness at Abriachan as neither of us had been before. There are 3 trails here 1 green, 1 blue and 1 red. We did the blue which was excellent, fast and flowing, well made and fairly dry and then we did the red! This was not so good, it is more natural than the other trails and at present is very wet and all the log sections are super slippery as they get no sun due to the fact that they are in the woods. After a few bashes around this we headed down to the bike obstacle course. This has loads of drop offs, seesaws, logs, bumps etc although again they were slippery due to being rather damp at present. Anyway a great little spot for working on the skills and having a laugh! 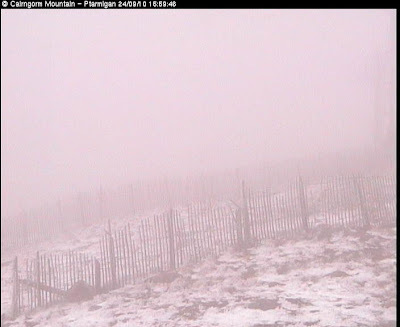 Snow in the Cairngorms this morning, so fingers crossed not too long before the winter climbing arrives! Although this is trying to sell their new range of axes it has some quite good shots. All you need for a little motivation to get ready for winter! Now I just have to get on a service my bike! I have spent the last week or so out on the bike as the weather has not been great. An afternoon last Sunday was spent on the red ring a Fochabers and then on Monday I headed to Aviemore with Monty. We linked up some landrover tracks as well as a section of great single track between Bothy Bikes and Feshiebridge and back again. Today was spent at the skills circuit at Forres. 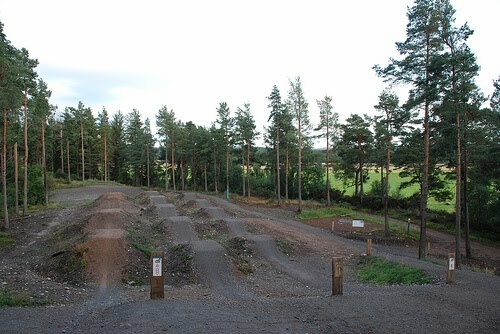 Although small this is a great area with all sorts of skills areas including the jumps area shown above. Looks like there will be more biking in the next few days as the weather is still fairly poor. 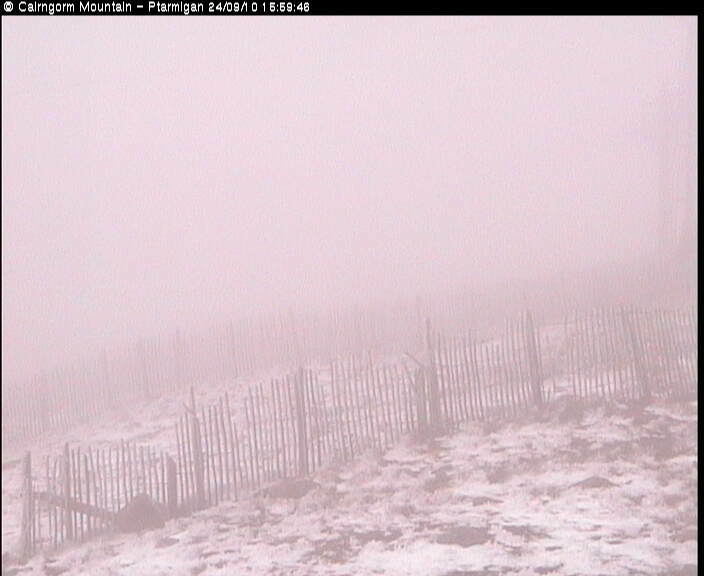 It is certainly feeling like winter is on its way up in Scotland!